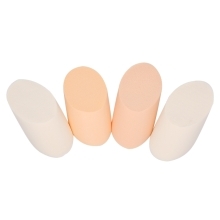 Makeup powder puff can be pointed the location of the position of even the most difficult on the nose, eye, and face, used for the foundation, blush, loose powder, help you create perfect and natural makeup. Pointed the location of the position of even the most difficult on the nose, eye, and face. Fit for all skin, help you create perfect and natural makeup. Evenly refreshing and salubrious oil control.